The story of the Green Children remained in the popular imagination throughout subsequent history, as testified by references to it in Robert Burton’s The Anatomy of Melancholy, written in 1621, and a description based on the 12th century sources in Thomas Keightley’s The Fairy Mythology (1828). There was even a supposed second sighting of Green Children in a place called ‘Banjos’ in Spain, in August 1887. However the details of this event are almost exactly the same as in the Woolpit case and the story seems to originate with John Macklin in his book Strange Destinies (1965). There is nowhere called ‘Banjos’ in Spain and the account is merely a retelling of the 12th century English story. Various explanations have been put forward for the enigma of the Green Children of Woolpit. The most extreme include that the children originated from a hidden world inside the earth, that they had somehow stepped through a door from a parallel dimension, or they were aliens accidentally arrived on earth. Scottish astronomer Duncan Lunan has suggested that the children were transported to Earth from another planet in error by a malfunctioning matter transmitter. A local legend links the Green children with the ‘Babes in the Wood’ folktale first published in Norwich in 1595, and probably set in Wayland Wood, close to Thetford Forest on the Norfolk-Suffolk border. The story concerns a medieval Norfolk earl who was the uncle and guardian of two young children, a boy aged three and a younger girl. In order to inherit their money the uncle hires two men to take them into the woods and murder them, but they are unable to perform the deed and abandon them in Wayland Wood where they eventually die of starvation and exposure. The Woolpit variation moves the story to Woolpit Wood, just outside the village, and has the children surviving attempted arsenic poisoning, to emerge onto Woolpit Heath where they were found by the reapers. Arsenic has been put forward by some as the reason for the children’s’ green skin, and the possibility that they were real-life 12th century ‘babes in the wood’ which inspired the folktale cannot entirely be discounted. The most widely accepted explanation at present, and also the most mundane, was put forward by Paul Harris in Fortean Studies 4 (1998). His theory is roughly as follows. First of all the date for the incident is moved forward to 1173, into the reign of King Stephen’s successor Henry II. There had been a continued immigration of Flemish (north Belgian) weavers and merchants into England from the 11th century onwards, and Harris states that after Henry II became king these immigrants were persecuted, culminating in a battle at Fornham in Suffolk in 1173, where thousands were slaughtered. He theorizes that the children had probably lived in or near to the village of Fornham St. Martin, hence the St. Martin references in their story. 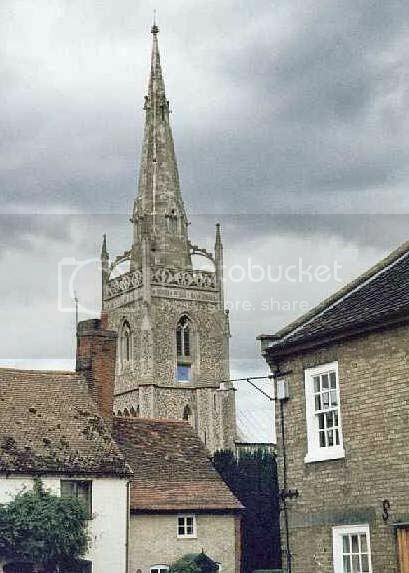 This village, a few miles from Woolpit, is separated from it by the River Lark, probably the ‘very considerable river’ mentioned by the girl in account. After their parents had been killed in the conflict, the two Flemish children had escaped into the dense, dark woodland of Thetford Forest. Harris proposes that if the children remained there in hiding for a time without enough food, they could have developed chlorosis due to malnutrition – hence the greenish tinge to the skin. He believes that they later followed the sound of the church bells of Bury St. Edmunds, and wandered into one of the many underground mine passages which were part of Grimes Graves, flint mines dating back over 4000 years to the Neolithic period. By following mine passageways the children eventually emerged at Woolpit, and here in their undernourished state, with their strange clothes, and speaking the Flemish language, they would have seemed alien to villagers who had not had any contact with Flemish people. Harris’s ingenious hypothesis certainly suggests plausible answers to many of the riddles of the Woolpit mystery. But the theory of displaced Flemish orphans accounting for the Green Children does not stand up in many respects. When Henry II came to power and decided to expel the Flemish mercenaries previously employed by King Stephen from the country, Flemish weavers and merchants who had lived in the country for generations would have been largely unaffected. In the civil war battle of Fornham in 1176, it was Flemish mercenaries, employed to fight against the armies of King Henry II, who were slaughtered, along with the rebel knights they had been fighting alongside.